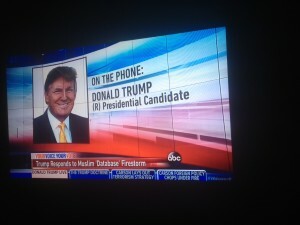 Rush Limbaugh shows up and I declare him mistaken! What’s this UN Article 13 Panetta says we need? Much more on this Sunday talk show thread. FOX NEWS SUNDAY (Fox Network): Republican presidential candidate Marco Rubio. MEET THE PRESS (NBC): Republican presidential candidate John Kasich; former Defense Secretary Leon Panetta; New York Police Commissioner Bill Bratton. FACE THE NATION (CBS): Republican presidential candidate Rand Paul; Sen. Dianne Feinstein, D-Calif.; Rep. Michael McCaul, R-Texas; Brett McGurk, presidential envoy for the global coalition to counter the Islamic State group. THIS WEEK (ABC): Republican presidential candidates Ben Carson and Donald Trump; Democratic presidential candidate Martin O’Malley; Reps. Keith Ellison, D-Minn., and Martha McSally, R-Ariz.
STATE OF THE UNION (CNN): Republican presidential candidate Chris Christie; Reps. Devin Nunes, R-Calif., and Marsha Blackburn, R-Tenn.; former Defense Secretary Chuck Hagel. Well yes, Marco Rubio was a guest on the show but I can’t remember and didn’t note a thing that he said. Rush Limbaugh, on the other hand, is a whole different story. 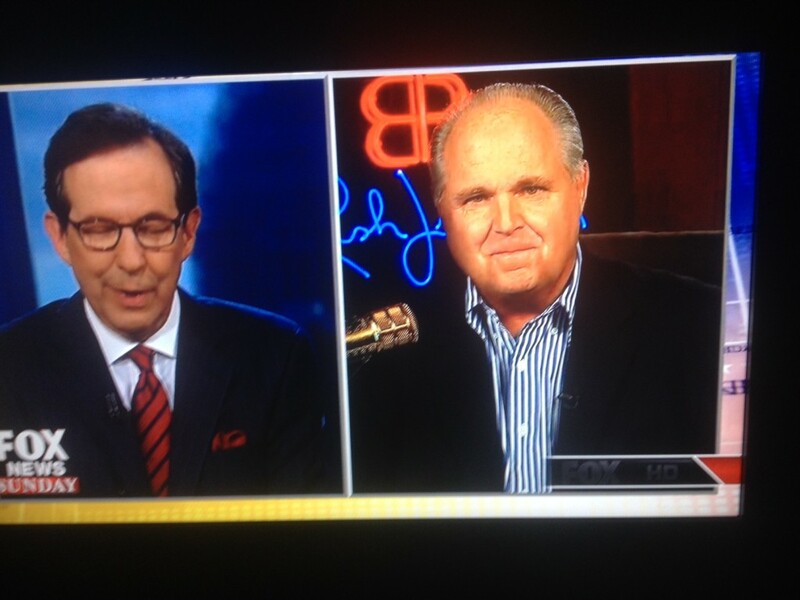 First, I love Rush Limbaugh. Me and twenty million other people listen to his show daily. Yon readers can make fun and mock but it takes big cajones to make fun of someone twenty million people like. To take the position that one is smarter than twenty million other people takes….well, cajones. Do not shout at the screen yon ladies and gems, I do understand the tyranny of the majority and all that. But Rush Limbaugh has been around since 1988. He has a huge audience and rarely loses a fan, usually ends up picking up more along the way. I also do love his patriotic young people’s books, something my granddaughter also adores. And, indeed, Rush was pushing his book, nothing wrong with a little capitalism. Second, my goodness didn’t Rush look awful good? Here’s a guy that could easily slip into middle-age fat-hood but he looked bright-eyed and bushy-tailed, yes he did. Thirds, got some gossip on Rush….I heard his wife Katherine, his THIRD wife by the way, is mysteriously ill. Well I read it in the National Enquirer but hey, they get a lot of things right, better than the Lamestream media at times. Finally of course Rush did an excellent job with his commentary, much more on point than Rubio, but to my great dismay, I discover Rush is actually WRONG about something. Though Rush would disagree with my assessment of the fitness of Jeb Bush as a candidate, I too disagree with him. Rush asserts that Jeb Bush seems to have no enthusiasm for this presidential primary. “He often appears to want to be anywhere but on the campaign trail,” Rush firmly declared. I agree that Jeb Bush often looks out of sorts and seems to lack any passion. But unlike Rush, I do not read it as any reticence on Jeb’s part to be President. In fact, I think Jeb Bush resents his dumber older brother who got to be president and can’t wait until his turn. The reason Jeb often looks so out of place is more because his campaign has been a wreck, an out of control, constantly changing panorama of different tacts and methodologies. I think for Rush to attribute Jeb Bush as uncaring and wanting out of the limelight is more beneficial to Rush himself than anything. This way he can blame Jeb for his failures without speaking ill about a Bush, a family Rush always seemed fond of. No, I’m not accusing Rush of outright lying. I just think he has a convenient explanation for Jeb Bush’s failing campaign that, on the surface, is believable. I think Jeb’s campaign is failing because, eh….the voters don’t want Jeb….simple as that. Jeh Johnson, this man with a name sounding like the letter “J” but he spells it JEH….that always annoys me….the current head of Homeland Security, made an appearance on this show. He mouthed the administration talking points, telling us that while there is not direct evidence of a pending attack, they are always monitoring all reports. The most interesting guest on this show was Leon Panetta, former Secretary of Defense. I am going to try and paraphrase what Panetta said though right now I have no idea what it means. ◾ (1) Everyone has the right to freedom of movement and residence within the borders of each state. ◾ (2) Everyone has the right to leave any country, including his own, and to return to his country. Panetta argued that this would have pulled NATO into the fray. Like I stated, I don’t quite understand how one “invokes” article 13 and I sure don’t understand how this involves NATO. It’s possible I misunderstood, will follow up on this. What’s notable here is that Panetta is a Clinton crony and he openly criticizes this Democratic administration and he does so quite often. So why didn’t France invoke Article 13 and bring NATO into the ring? Well he didn’t claim to have actually fought ISIS as in mano-to-mano. But he has this loud lead he does, beginning with the claim that out of all the Republican presidential contenders he is the only one with any experience at fighting terrorism. Which makes my jaw drop because this isn’t the first time he’s made such a misleading statement. Christie does go on to explain that he actually PROSECUTED terrorists during his term as prosecutor but somehow, at least as I see it, that’s not quite the seem thing as declaring and leading a war on terror. 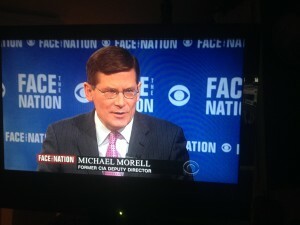 It was the lying Mike Morrell, the guy who got on the stand and lied for hours about Benghazi, that gave the most intriguing talking point on this show. He patiently explained that Teddy Roosevelt could not get America to enter the war with Germany until after the attacks on Pearl Harbor. What’s his point? President Obama should wait until an attack on America by ISIS? As an interesting aside, what the hell is Karl Rove now doing as a pundit on this show? He got fired at Fox? This Week-Donald Trump, you knew he’d show up. 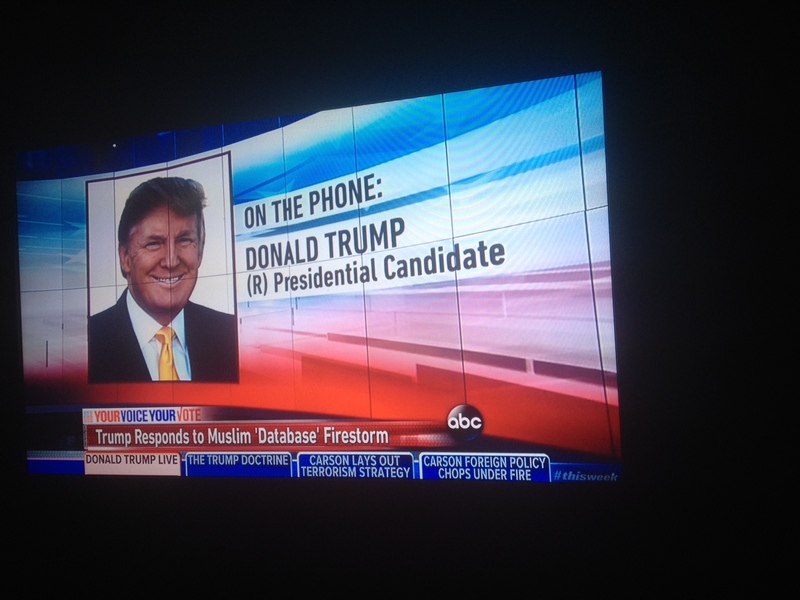 It was on this show that Donald Trump gave a great interview, explaining his fluff about Syrian refugees and databases. It was a lot of ISIS talk, Assad needs to go, every Republican primary presidential contender had a way to beat ISIS and rip off their heads. You ever notice how Hillary never goes on any of these shows? She’s got that Democratic nomination so sewn up that she can sleep late on Sundays and let the peasants do all the work. Beyond the talk of controlling terror, and lots of well earned criticism of President Obama, the Sunday talk shows were mostly one topic, but it was an important one. 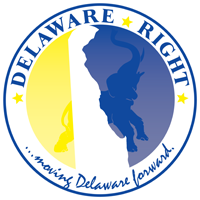 NEXT : Some Delaware tidbits and national news being dished up this Thanksgiving week. 12 Comments on "The National Scene-The Sunday Political Talk Show Report on 11/22/15"
Frank, why do you let this ignorant woman pollute your blog? Yes, of course, after the second attack on Pearl Harbor, Teddy Roosevelt invaded Cuba to keep the Russian missiles out. Whenever I listen to Johnson’s vacuous nonsense, I only have one thought; of all the people in a nation of 300+ million, Obama manages to find an idiot to run Homeland Security. Conservative mentality typically can’t not stand up to critical analysis. Funny, since modern “liberalism” is an emotional state. This is why “liberal” talk-radio always fails. Unlike television, on talk radio the host’s crackpot notions can be challenged by callers. The host’s “liberal” positions simply “cannot stand up to critical analysis.” Conversely, conservative talk radio- and the hosts- can withstand callers’ criticism. Simpler explanation: Liberals have lives. Fascist-conservatives have fantasy lives. Pat would, of course, not understand that the UN and NATO are two different organizations with different members and purposes. Panetta was not talking about Article 13 of anything. He was talking about Article 5 of the NATO treaty which requires all NATO members to provide military aid in the event that any one of them is attacked. In the wake of Hollande using the term “war” in response to the attacks, there was some question as to whether he was invoking Article 5 of the NATO treaty (which France later clarified they were not). Yeah. Delusional lives based on emotion, perpetuated by lies and protect by propaganda, PC and the thought police. Blind, lockstep rigidity. Sort of like The Third Reich Way. There’s no bigger fascist in America than Obama. No president has ever had closer ties to corporate interests; Solyndra, General Motors, Goldman Sachs and his buddies in Silicon Valley and Big Media. No, not really, because I think, you know, it’d be nice to have the Russians be part of that, but I’m not sure they will and I don’t think Iran would, as well. My focus would be to have NATO countries. I’m a little surprised that they haven’t invoked Article Five of the NATO Charter. We invoked Article Five after 9/11. They certainly do it now and be able to get NATO and its military forces engaged in that effort. Secondly, we need the Arab countries. The moderate Arab countries, Saudi Arabia, UAE, Jordan and others, to be part of that effort. So Pat then looks up Article 13 of the UN Declaration of Human Rights. Naturally. … unless you are a Palestinian. The Universal Declaration of Human Rights:Article 13. Anyway, no UN diktat supersedes U.S. law.